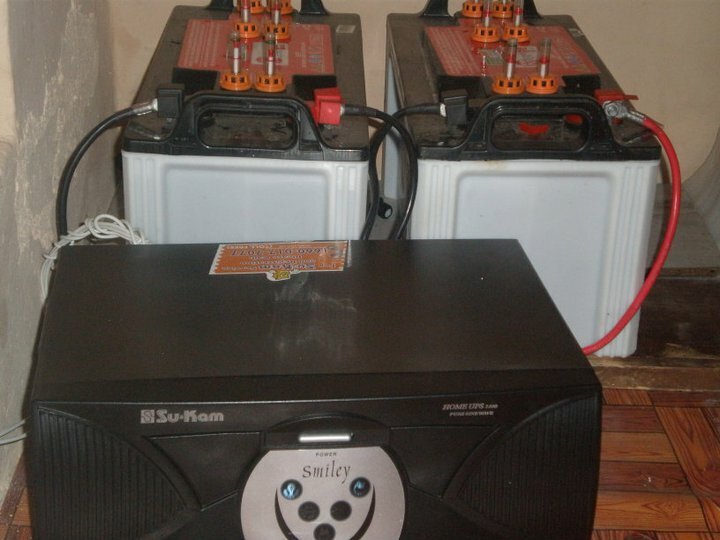 Jackie's Nepal Blog and Other Wanderings: What's an inverter? I don't think twice about whether or not the lights will come on when I flip the light switch in my house. I turn on my desktop computer and voila, as long as it is plugged in there is no reason why it should not power up if it is in good working condition. For the most part, barring a storm causing an outage, we are very fortunate here in the U.S. to have guaranteed electricity 24 x 7. Not everyone is so lucky. In Nepal, if you live in the Kathmandu Valley, you could experience 8-10 hours of load shedding each day. This essentially means, no electricity during that time frame, which usually happens for part of the day (longer) and part of the night. It is especially long during the winter when the rivers are running low and the already low supply of hydroelectric power becomes even less. You may be wondering why a country like Nepal with so many glaciers and rivers would have a problem generating hydroelectric power. I don't know enough to explain the complex reasons and perhaps I'd better leave that up to the 'experts' to explain. But what I do know is that in order to generate more power, dams would probably need to be built and you can imagine what that could mean for the environment and people living close to the rivers if done on a grand scale. Nepal is not alone when it comes to dealing with power issues. So what's an inverter? That's exactly what I was asking myself when I heard from Amrit that they would be getting an inverter donated to them by Kindness in Action. Some of you already know what an inverter is, but I didn't and this is not surprising since I've not had a reason to need one. Essentially, it is like a generator but instead of using gasoline, it takes battery power (direct current) and converts it to AC power (alternating current) which allows you to run appliances or anything needing electrical power. It's like when you plug in your boom box into your car's cigarette lighter socket using that funky plug adapter (aha! the inverter!). They come in different sizes so to speak, depending on what you would be using it for. In the case of DHC New Life Centre, they will be using it power the lights while the kids study or do their homework. Being without power affects the everyday person's way of life in Nepal in ways I can't even comprehend, like when to use the computer, when to study, when to do work that requires electricity, everything! The new inverter that was donated by Rose Stevens via Kindness in Action will help the kids at DHC New Life Centre tremendously. Below is a photo of their new inverter. Anyway, I learned something today with the help of the internet, which I could quickly access via my electric powered computer, on demand. How fortunate are we. I am thrilled to hear that the DHC has received an inverter! In a country trying so hard to function without power on a daily basis, it warms my heart to know that some of the people often most overlooked by the government have something to make their lives easier. Thanks for the informative post about load-shedding and other technical stuff!